This pretty half-timbered house was, in 1964, the first house to be renovated in the historical centre of Troyes. It is a symbol for all of the city lovers: it was to be demolished but thanks to a long battle waged by people interested in saving the local historical heritage, it was preserved. Thus was born the Association pour la Sauvegarde du vieux Troyes in 1963. This house is called the Maison du Boulanger (the bakers’ house). It has a corbelled construction, a gabled roof and projecting roof timbers. The dormer window on the roof that opens onto the rue Paillot-de-Montabertstill has a pulley that bakers used to raise bags of flour to the loft. Since 1975, the Maison du Boulanger houses Troyes Cultural Centre. This neighbourhood and in particular the rue du Domino, now called the rue Paillot-de-Montabert, was, in the 16th and 17th centuries, where the silversmiths worked. 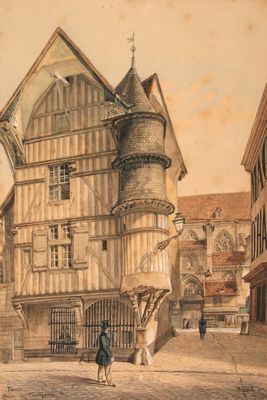 One of them, François Roize, had the house on the opposite corner built between 1578 and 1618. Space was so sought after that he had his corbelled stairway installed here, in a turret supported by two caryatids and a Telamon, the floors and conical roof of which are covered with slate tiles.